Ummm, did that just happen? Sausage lasagna for breakfast? Am I dreaming or is this real life? it’s for realz. And it’s amazing. 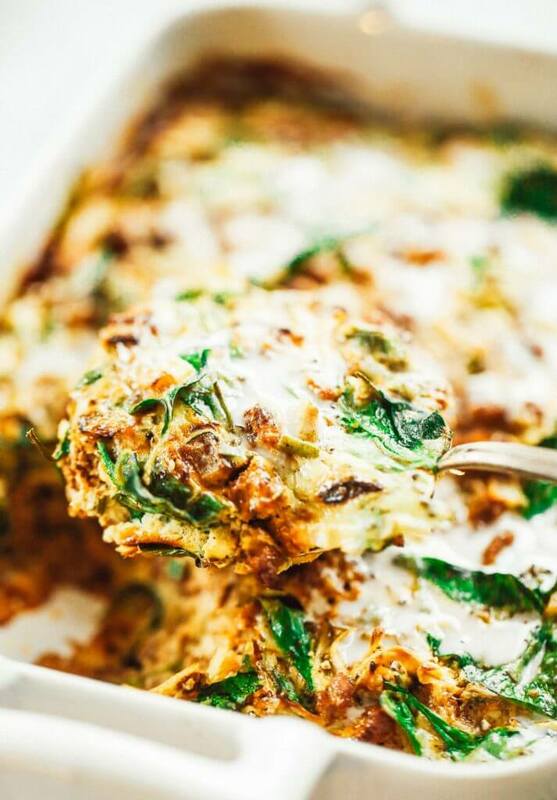 Best part about this breakfast lasagna: it’s 100% good for you! Yasss. I did. Just did. I just ate this amazing, bursting-with-flavor casserole; and ahhh… you need it! Fantastic news for you- it’s insanely easy to make and be in your tummy SOON. I hope you love this incredibly flavor packed Italian herb, potato, and sausage lasagna… That also happens to be paleo, whole30, and dairy free. Woot!! In real life though, I already ate this sausage potato lasagna for breakfast…. then for dinner. And now, I’m sitting in my room stretched out in yoga poses while editing blog posts and tuning into WSL. One of my favorite ways to wind down and spend the evening, a little movement, a little entertainment, and a little work. I mean, pj’s pass as appropriate office attire around here, as you can see. A peek into my world right now. It’s supposed to be spring around here; although, somehow, the snowflakes always welcome themselves around this time in March. With freezing temperatures and ice-skating rinks for stairs, I packed away my denim shorts this week and dove into the warm world of casseroles and lasagna. They didn’t disappoint! Lol never mind I see it! I made this without the sausage. I used mushrooms instead of the sausage. It was really good! This looks great! Do you think I could assemble it the night before and just pop it in the oven in the morning? Could I use regular sweet potatoes for this recipe? Hi Danielle, regular potato would totally work! Any replacement I can do for eggs? If you’re freezing it – are you doing it cooked or uncooked? Then baking from frozen or defrosting then baking? I’d like to double it up and freeze one for a later meal. Hi Pat, they are just sweet potatoes that have a white coloring on the inside instead of orange like yams. 🙂 Hope that helps. Love the idea of this dish! We have a favorite Farmers Market pork sausage that I planned to use for this. I tasted after the sausage was cooked. Oh oh. Pretty spicy. Unfortunately, they gave me Italian sausage instead Of simple pork sausage. Sigh. It was spicy but sour cream helped cut it. I think the next time I make it, I will double it for a bigger pan (I always put more veg in something like this), and maybe use turkey sausage. Anything I can substitute for the sweet potato…I am Candida and have to avoid any kind of potato. Hi Jamie, you might be able to sub it with zucchini? The flavor was good but this turned a little dry. Maybe overcooked the Turkey so next time I’ll add a little salsa. I think that’ll help and will taste good. The high in protein kept me full.